Moving all of your worldly possessions can be a stressful and time-consuming process. For many, once they have made the decision to move, they are ready for the process to be over and done with so that they can be in their new space. This is possible when you work with the right moving company in Washington DC. Call us at Suburban Solutions to find out how we can help you during this potentially stressful time. Tips For A Successful Interstate Move. We offer the following tips to help your move go as smoothly as possible. 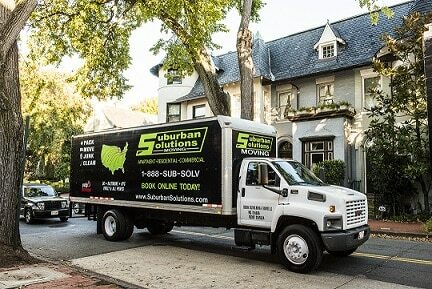 If you’re considering working with a moving company in Washington DC, all us at Suburban Solutions for a free price quote. We also offer cleaning services and junk hauling. The following packing tips can help you prepare for moving day. By having your belongings packed and ready to go, the moving process can go efficiently and as quickly as possible. Create a moving “to do” list. This will help you to be organized and clear around tasks that you will need complete before the move. Throw out the stuff you don’t need anymore. Donate old items or have a garage sale. It can greatly reduce the stress on moving day if the items you don’t want are already gone. As a moving company in Washington DC, we can remove those items for you and transport them to charity organizations as well as to the local refuse facility. Find the right moving company in Washington DC. Get written and detailed price estimates from each one so that you know what to expect in terms of cost and services that they will provide. Depending on the time of year that you move or the day of the week, rates charged by a moving company in Washington DC can vary. Collect boxes from local stores and community members by posting requests in social media groups and online marketplaces. By doing this ahead of time, you can avoid spending money to purchase moving boxes. Gather all of your packing supplies such as labels, tape, and boxes. This can prevent last minute, stressful trips to the store for the items you need. Use items like clothing, bubble wrap, and packing paper to protect fragile items. Clearly label all boxes with the contents and in which room they belong. This will help on moving day and after you arrive at the new home when you are trying to decipher what each box contains to find the items you need. This will also help moving day go faster as it will help the moving company determine in which part of the house to place the boxes. Call utility companies and cable companies to schedule a shift in services. They should be able to turn everything off at your old home and transfer service to your new home. Pack heavy items such as books into small boxes to make sure the overall weight is manageable. Pack everything you rarely use well in advance of moving day. This should include clothes that are not in season or decorative seasonal items around your house. Change your mailing address with the post office, utility companies, and for all of your charge accounts and any other accounts that send mail to your home. For many of them, you should be able to do it online without having to call. By putting the time and effort into planning your move you will be able to ensure that moving day runs as smoothly as possible. Among the moving companies Washington DC offers, choose one with good reviews, is insured, and offers the services you need at an affordable price.